Here we go again then. It appears that I am well on the way to building a new micro layout. The spark generated by the finding of the old munitions layout structures and placing them in an APA box has turned into something more serious. Having much of the material ready to hand has certainly helped for after a few days I already have something looking like a model railway. The first thing was to delve into my supply of APA boxes and make one. I made one change in the build. I didn't put a floor in, just in case access was needed to wiring as well as being able to access coach bolts that would be used to join the fiddle yards. Erring on the side of caution, I also added a brace to the frame. I'm not entirely sure that this is needed, as APA boxes are very well made, and my chosen baseboard material 10mm cork faced foam core is light and rigid. Still, "Better to have it and not need it, than need it and not have it." I always say. I came across the 10mm foam core in Michaels craft store quite by accident. I think it was planned to be the basis of cork notice board projects or something similar, But I immediately thought of it as perfect as a micro layout baseboard, much like the APA box. at 30" x 20" it had to be trimmed to fit inside the APA. but it looks good in there. With that in place. I could begin on the track planning. The size of the structure dictated the track plan would be a simple Inglenook. Each siding would hold about three of the wagons based on Bachmann vee skips I'd worked on before. Concept being developed. Track placed, view blocks being established. Inlaid track is an important feature of this model. Originally I'd considered making this from 5mm foam core board as that matched the height of the code 100 track I was using. But as I cut more and more of it to test the idea the less I liked it. So I tried styrene sheet instead. Liking that much better as things developed. But as I test fitted foam core flooring I noticed how good things were looking. The right hand side. 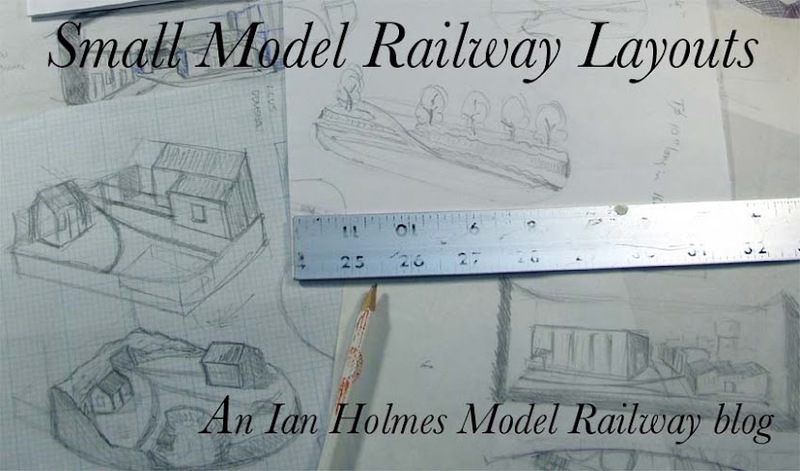 I might model a blast door across the track to hide the exit to the fiddle yard. Left hand side. The view block room in front hides the exit very well. I like the angles, the viewpoints, the way the tracks appear and disappear off stage. The two offices in the middle are ripe for being detailed. In my minds eye I can start to see the walls and roof of the cave starting to take shape. Things are going well. An inveterate blogger I like to blog about the things that strike a passion with me, and share my enthusiasm for them with the world.